Machine-learning techniques that mimic human recognition and dreaming processes are being deployed in the search for habitable worlds beyond our solar system. A deep belief neural network, called RobERt (Robotic Exoplanet Recognition), has been developed by astronomers at UCL to sift through detections of light emanating from distant planetary systems and retrieve spectral information about the gases present in the exoplanet atmospheres. “Different types of molecules absorb and emit light at specific wavelengths, embedding a unique pattern of lines within the electromagnetic spectrum,” explained Dr Waldmann, who leads RobERt’s development team. “We can take light that has been filtered through an exoplanet’s atmosphere or reflected from its cloud-tops, split it like a rainbow and then pick out the ‘fingerprint’ of features associated with the different molecules or gases. Human brains are really good at finding these patterns in spectra and label them from experience, but it’s a really time consuming job and there will be huge amounts of data. 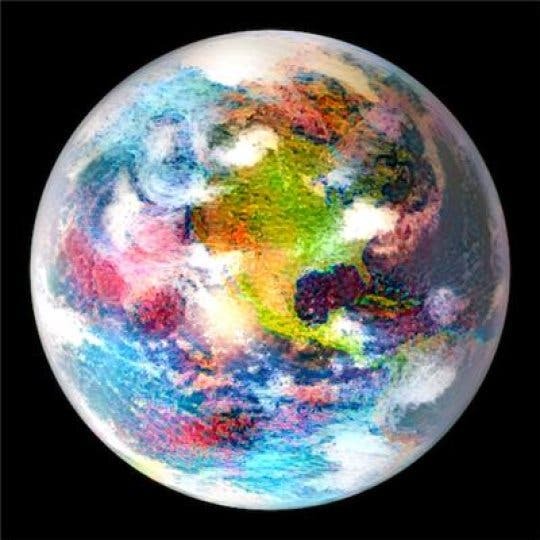 A neural network’s dream of Earth, is shown above. Similar to RobERt dreaming of exoplanet spectra, this neural network was trained to dream in the style of a Monet painting. Deep belief neural networks, or DBNs, were developed more than a decade ago and are commonly used for speech recognition, Internet searches and tracking customer behaviour. RobERt’s DBN has three layers of unit processors, or ‘neurons’. Information is fed into a bottom layer of 500 neurons, which make an initial filter of the data and pass a subset up to the second layer. Here, 200 neurons refine the selection and pass data up to a third layer of 50 neurons to make the final identification of the gases most likely to be present. To prepare RobERt for his challenge, Waldmann and colleagues at UCL created a total of 85,750 simulated spectra, covering five different types of exoplanet ranging from GJ1214b, a potential “ocean planet,” to WASP-12, a hot Jupiter orbiting very close to its star. Each spectrum in the training set contained the fingerprint of a single gas species. RobERt’s learning progress was tested at intervals during the training with ‘control’ spectra. At the end of the training phase, RobERt had a recognition accuracy of 99.7%. RobERt’s DBN can also be reversed so that instead of analysing data fed into the system, he can enter a ‘dreaming state’ in which he can generate full spectra based on his experiences.